It was naturally only a matter of time before one of Tony Stark's bitter enemies (of which there are many) used his passion for the Initiative and his special connection to the Order against him. And that's exactly Zeke Stane, the son of Iron Man's arch-nemesis / corporate rival, the late Obediah Stane, has done over the last few issues. He's worked out a formula that strips the team's members of their powers, and used it to overload the mind of Mulholland, the crew's resident psychic. The powerful mental outburst led the entire population of Los Angeles to riot, and without their powers the Order is in no position to help. In short, it's one big public relations nightmare for the crimson-clad director of SHIELD. Matt Fraction's story may be complex, but the basic plot points are easy enough to understand. Zeke Stane, his criminal mastermind, makes for great entertainment. He's manic and blood-hungry, reveling in the moment of his greatest victory. His plans are clever in their simplicity, make for an intriguing conflict, and tie neatly into the real uncertainty of modern America. In the same vein as some of Alan Moore's finest creations, he's not laying out his plans to the heroes, leaving them for dead somewhere and hoping they don't miraculously escape to thwart him… he's already executed his plot, and now merely basks in the afterglow. Zeke's personality stands in such sharp contrast to that of the Order's members that I actually found myself pulling for the bad guy. This team is so wooden and stereotypical that I can't really understand how anyone couldn't. Where Stane is asking questions and making changes, the Order is merely trying to restore the status quo and failing to ask whether it's something that's even worth reviving. 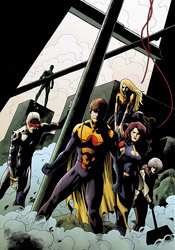 Whether or not Fraction's goal was to lead his readers to make that revelation themselves is debatable, but considering the book isn't dubbed Zeke Stane and Friends, I'd be willing to bet that it wasn't really in the plans. This is an intriguing read, but not for the reasons I think Fraction intended. The book's artwork struggles to find an identity, and never really seems to settle on one. That can probably be attributed to the dozen different artists with their hands in the mix this month, (OK, half a dozen) but an understanding of the causes behind this problem won't do much to alleviate it. The issue's visuals feel both dated and rushed, like many of the comics published by Valiant in the early '90s. They're heavy-handed and uncertain, hard to follow and short on personality. On a few flickering instances, a fine illustration will pop its head through the garbage and surprise you, but for the most part this is bonafide crap. It's detailed when it needs simplicity to direct the reader's attention, and overly simplistic when the story asks it to help drive the narrative with specific details. There's no flow to this artwork, no identity granted to the characters, and no excitement to inspire the reader to continue reading onward. This was a series with an identity crisis, and that's never been more evident than it was here in its final issue. Though Matt Fraction's concepts remain fresh, original and wholly entertaining, his execution here is murky. I wasn't given a reason to pull for the team, or even to identify with them and as a result the big conclusion felt unrewarding and hollow. Mediocre storytelling and awful artwork means The Order #10 lands somewhere near the bottom of my list of recommendations. Although Zeke Stane is a great character that I want to see more of, I'm going to suggest you skip this.